Cord-cutting has not only been a boost to internet streaming but has given new life to receiving TV signals via an antenna. Instead of paying high/cable satellite bills, you can receive free TV over-the-air. However, there is more to receiving TV signals than buying an antenna and randomly placing it somewhere indoors or outdoors. There are ways to ensure that you are receiving the most channels possible. To improve your TV reception, you need to know what affects it. Here is what to consider. You may be too far from one or more TV station transmitters, which will prevent you from receiving a signal, but you may also be too close. If you are too far you will experience "The Digital Cliff" which is an abrupt TV signal drop-off. This is a by-product of the switch from analog-to-digital TV broadcasting. With analog TV signals, as distance increased between the TV transmitter and the receiving antenna, there was gradual fading. Although you could be too far to receive the best quality, you could still watch a low-quality signal with "snow" if it didn't bother you. Since TV signals are now transmitted digitally (1's and 0's), there's no gradual fading as distance increases. You receive full quality all the time, intermittently or not all. As you approach "the digital cliff", the image may appear blocky or cut out and come back. On the other hand, if you're too close to a TV transmitter, the signal may overpower your TV tuner or DTV converter box and, in some cases, damage it. TV signals can be affected by physical obstacles including hills, and trees. Some materials used in home construction, such as stucco, concrete, aluminum siding, metal roofs, foil-lined ducts and conduits, and solar panels limit the effectiveness of indoor or attic-placed antennas. Weather (wind, rain), interference from certain types of electrical equipment, and LTE cell towers may sometimes temporarily cut off the TV signal. At very long distances, even the curvature of the Earth can affect TV signal reception. You might have several station transmitters in your local area, but they may not be in the same location. One station might transmit from north of you, another west of you, and another from the east. If you have a Directional Antenna, it may not receive signals from multiple transmitter locations. On the other hand, if you a have a Multi-directional or Omni-directional antenna, interference is more likely. If you have more than one TV connected to the same antenna using a splitter, the signal will lose strength. If there are three or four TVs connected to an antenna in this manner, you might find that one or two might look fine, but the rest may only receive signals intermittently or not at all. You may have created a homemade "cliff effect". Another factor that affects TV signal reception is the sensitivity of your TV's tuner or, for those still using analog TVs, the sensitivity of a DTV Converter Box. Armed with the knowledge of what causes TV signal reception problems, you can use one or more of the following options to boost your TV signal. Remove Obstacles: Remove obstacles that you have control over. Make sure your Antenna has a clear shot in the direction of the TV station transmitter. Check and Replace Antenna Connections: Make sure your antenna and TV connections are secure. Check for brittleness and fraying. If you have an outdoor antenna, cables can get worn when exposed to the elements and indoor antennas can be chewed on by pets (or uninvited animal guests). Make sure the antenna connection terminals aren't rusted and check the entire length of the cable, if possible for breaks or cuts. Of course, you may not be able to check the portion of the cable that may be running through a wall. If the cable is left over from the analog TV era it may be 20 AWG (American Wire Gauge) RG59. If so, consider replacing it with a thicker 18 AWG RG6 cable. RG6 does a better job with digital TV signals as it accommodates wider bandwidth, long distance runs, and holds up better outdoors. Costs related to cable purchase will vary depending on brand and length, which prices started at just a few dollars for a three-or-six foot length. Run a Channel Scan: After checking antenna placement and connections, go into your TV or DTV converter box setup menu and run a new channel scan. This will enable the TV to add any new channels that weren't available on previous scans. If the station registers, you should be able to watch it. Use a Rotor﻿: If you have an outdoor antenna and are receiving TV signals from several directions adding a rotor to re-position your antenna when needed might help. However, this solution is expensive with prices for a complete kit ranging from about $100 to $200 or more. If you know the transmitter location of stations you what to receive, you can use a rotor to direct your antenna to the new channel(s) and add them manually to your TV channel listings. Note the rotor position used for a receiving new channel(s). If you move your antenna using the rotor and you rescan channels, it may no longer list your previously scanned channels if the antenna doesn't receive them in the new position. Move Your Antenna: If you have an indoor antenna, placing near, or on a window will avoid materials used in wall construction that could interfere with the signal. Also, place it as high as possible. However, if the length of the cable that goes from the antenna to the TV is too long the signal may be weakened. To assist, you may need a signal amplifier. Use a Signal Amplifier: If you are having trouble receiving TV signals and you only have one TV, you can place a signal amplifier (aka signal booster) between the antenna and your TV to boost the signal. This also helps with low-sensitivity TV tuners or DTV converter boxes. Just connect the cable coming from the antenna to input of the amplifier and the output to your TV's antenna input. You need to plug the amplifier into power for it to work. Use a Distribution Amplifier for Multiple TVs or Use a Separate Antenna for Each TV: If you have more than one TV, ideally, you should have a separate antenna for each as splitting the signal will decrease the signal strength, especially if the cable distance from the signal splitter and one or more TVs is long. A more practical solution is to use a Distribution Amplifier. You connect the main feed from the antenna to the input on the amplifier and then connect the outputs of the amplifier to your TVs. Distribution amplifier prices will vary depending on brand/model and the number of outputs that are provided. Get an Attenuator. If you are too close to the TV transmitter and the signal is overloading your tuner or DTV converter box, you can use an attenuator to reduce the strength of the signal. Ideally, an attenuator that has a continuous adjustment gives you the ability to set the amount of attenuation (gain) that may be needed for different channels. The most common type is a small inline unit that you insert between the antenna and your TV (or DTV converter box) that has a fixed amount of reduced gain (3db, 6dB, 12dB). The hard part is figuring out how much gain reduction you actually need. Getting one that has a variable gain control (3dB to 12dB) is best so you can adjust it. Don't fall for HD antenna advertising hype: Any TV antenna will receive analog, digital, and HD TV signals. Even those old rabbit ears that you put in storage in the garage when you switched over to cable/satellite can be used to receive digital and HD TV signals if the station transmitter(s) are in range. However, newer antennas do have better designs for pulling in signals but not because they are labeled HD antennas. If you canceled satellite, you can't use the dish to receive over-the-air TV signals: The dish is not the correct shape and has internal circuitry that is not suitable for broadcast TV reception. However, if the coaxial cabling that connected the dish to your TV is in good shape, you can replace the dish with a TV antenna, if the location is clear of obstacles for receiving terrestrial digital TV signals. Check out an example of how to replace the satellite signal receptor with a TV antenna. Find out if local stations are broadcasting on VHF or UHF: As a result of the DTV transition in 2009, most TV stations that formerly broadcast on channels 2-13 (VHF band) have moved over to UHF (channels 14-83) for digital broadcasting. Since it takes more power to transmit at higher frequencies, the effective range of their signals may be reduced. With the FCC reallocating portions of the TV broadcast spectrum for other uses, it has authorized a re-pack program where select TV stations are changing their transmission frequencies and transmitter locations (some for the second time since the original DTV transition). Switch from an indoor to an outdoor antenna: An outdoor antenna can greatly improve your TV reception. If you have a Directional Antenna, you might try switching to an OmniDirectional antenna. This will provide better access to TV signals from different directions, but the sensitivity of the antenna is decreased for signals coming from a specific direction (the antenna is less focused). Where a directional antenna may receive a station farther away in a single direction, you may lose it if you switch to an omnidirectional one that works well for closer stations. 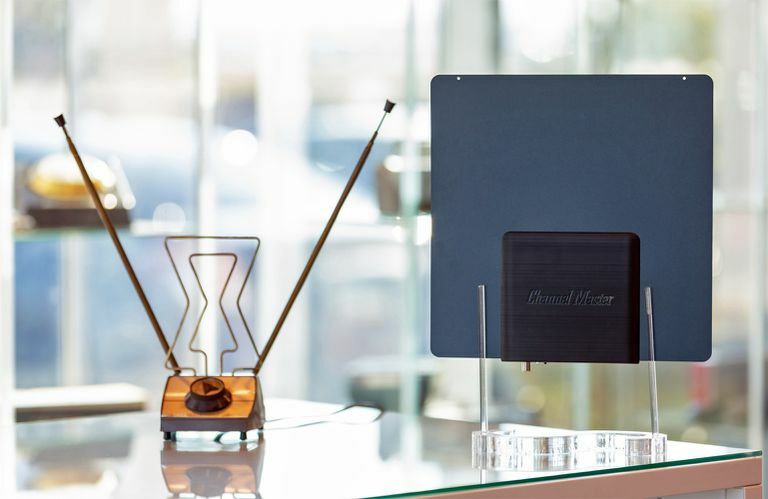 Antenna prices vary widely and can range from less than $10 for a basic indoor antenna to over one hundred dollars for a long-range outdoor model. Don't assume that the distance range listed or advertised for your antenna is accurate. Ratings may be based on optimum conditions.